Sheila opened her eyes the moment she heard the alarm rang for five minutes then turned it off. Her mouth pouted when she realized that this is already Monday. “God, please, couldn’t every day just be Sunday? !” She puts her hands on her face. Yes, she really doesn’t like going to school. She just forces herself to go. There is something interesting about Sheila. She is not like that kind of teenage girls that seems to be so inseparable from a thing called mirror because they most likely admired their beauty. For her, she looks to the mirror and hates herself instead of admired it. She doesn’t hate the mirror, it’s just torturing for her to see her own reflection. She hates living a life as a fat and ugly girl. She hates being bullied, and that’s why she’s not enjoying her life as a teenager in middle school as the other students do. The way people are laughing at her and underestimating her makes her self-esteem becomes lower and lower; she feels useless. That’s what she heard every time she arrives at her class. Today is no exception. Her classmates are making fun of her by changing the pronunciation of her name so it could sound as Shyla instead of Sheila. Shy, oh what an adjective to my “–la”! How creative! She thought sarcastically because she doesn’t understand how do people expect her not to be shy after they called her fat and ugly?! The only thing that Sheila loves about school is the bell when it rings at the end of the day to tell people to go home. On the way home today, she found something that is quite interesting for her. As she walked pass by another school, she saw a girl that she thought is exactly look like her. The only different thing is that her eyes and face looks so bright. Sheila can tell that the girl is living a better life. 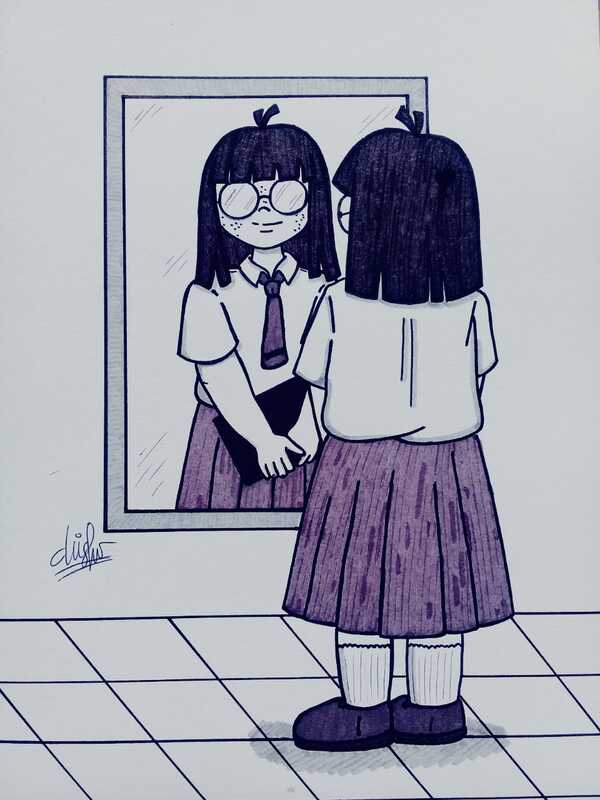 After that moment, she always sees the girl along with her own reflection every time she looks into the mirror. She’s wondering what makes them different. Even though she is kind of envy of her, it also motivates her to be just how the girl looks like; to be happier. Finally, she sees hope because she never imagined that she could ever be happy before. Along with the help of the school’s teacher-counselor, she begins to embrace herself just as the way it is. She begins to love herself regardless of what people say to her. She begins to realize the reflection of the girl she once saw accidentally to be her own. She begins to see herself, her happy one, in the mirror. Little she knows that the girl never exists in the first place. It’s all only the effect of her loneliness and the mirror is just reflecting her deepest hope. It’s just reflecting another version of her, the one she hoped to be if she hadn’t been bullied. Good for her that the reflection helped her to be how she is now. She is smiling, she is happy, and it’s not just a reflection in the mirror.